I really can’t find the right words to elucidate my appreciation for waterfalls. I constantly find it fascinating whenever I get the chance to gaze at its innate beauty. The brook gurgling sound that runs over the beam like rocks going to the deep and the cold catching basin is something that renders me a true peace and fulfillment. It is something that makes me go back no matter how steep the trail is, as long as I traipse my feet along its stunning beauty. Truly, right after enjoying the cold and fine cloudy water droplets of Ulan-Ulan Falls, there’s actually another waterfall that has long been waiting for all of us. It is peacefully hiding above the Ulan-Ulan Falls and it has a cold and deep catching basin. I felt like I wasn’t satisfied enough with how I flirted with Ulan-Ulan falls because of the unfavorable leisure time that I should have had. And because of that, I was also thinking that travelling to the Recoletos Falls might fill my delectation. 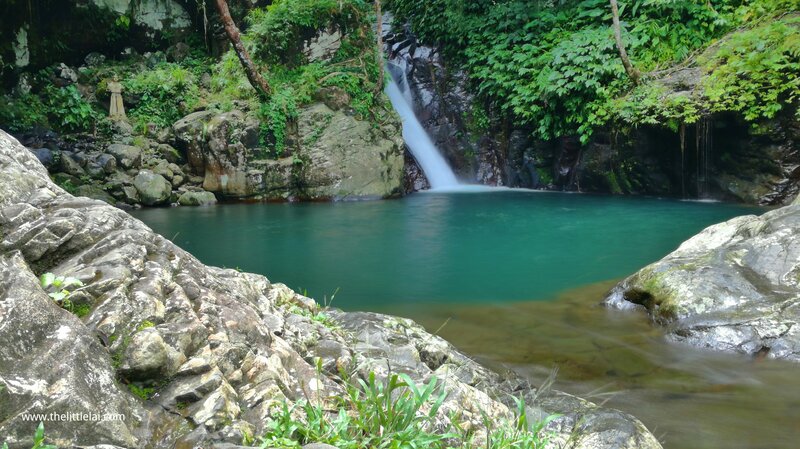 Recoletos Falls is located just above the Ulan-Ulan Falls and peacefully hiding in the lush scenery green forest of Sampao, Almeria, Biliran. Getting to this waterfall from the jump off area will take you approximately 30 minutes of a smooth trek and a 5 minute walk from the well known Ulan-Ulan Falls. 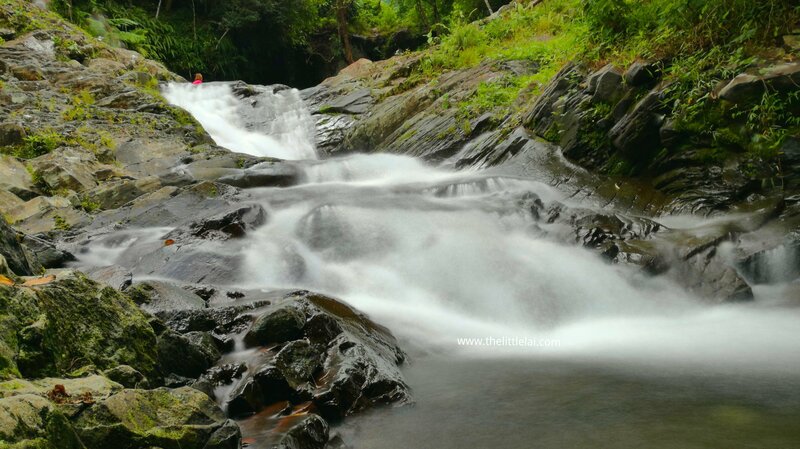 While on your way to this waterfall, it provides you a beautiful scene that would surely mollify you. The stream of water that flows in the mountain of Almeria is somehow creates and hides a mass of amazing waterfalls and an awesome spot for Canyoning and river trekking. 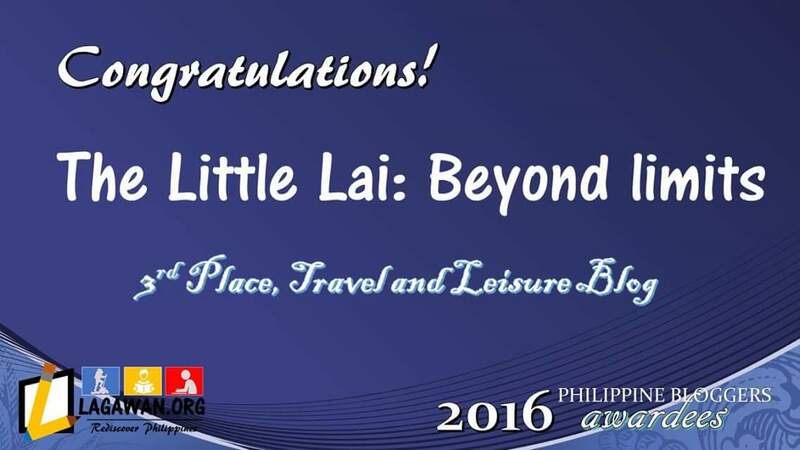 No wonder that Biliran is known for a great adventure which will surely unlock your wanderlust soul. The Recoletos waterfall is estimated approximately 15 meters high. It owns a wide pool with deep cold water that is perfect for swimming and cliff jumping. There’s a wide and flat stone surrounding the catching basin, which is perfect for those that loves to commune with nature and a great spot for picnic. The area is surrounded by green foliage which provides an umbrageous spot to protect you from the clinging heat of the sun. It is said to be one of the reasons why the water is really cold. While on our way to Recoletos Falls, we were happily greeted by the stream of water freely flowing along the natural flume. The place is truly untouched and the solitary sign of development in the area is the not so narrow bridge which is used by most locals and visitors in order for them to cross to Recoletos Falls. As shortly as I’ve seen the waterfalls, a wide and greenish water seemed to be so tempting. But before I decided to douse myself in its cold water, I try to capture some photos and it took me sometimes to decide whether I jump in its cold deep water or remain standing on the well designed rocks while watching my friends who have been enjoying the natural pool of Recoletos Falls. I saw how happy they were while swimming in the natural pool and some of them were courageous enough to jump from the high level of the cliff. Yes, there’s a perfect spot for you to jump if you want to make your Recoletos Falls experience awesome, but make sure to be extra careful cause climbing to the higher level is a bit slippery. The defining moment came, I jump in its cold water and swim. Truly, the water is really cold and appears like a thousand of ice, which is brisk from the fridge has been thrown in the natural pool. I genuinely have enjoyed the whole time I drenched myself in its cold water. What I like about it aside from the cold water that gives me refreshing feeling is how wide the natural pool is and not herded, in fact, it was only our team who truly have enjoyed the waterfalls during our visit. I can truly swim freely without bothering to think about the crowd. Our guide reminded us about our time, we then quickly set up ourselves for the coming backbreaking trek going to Mt. Tres Marias and dousing ourselves in the frigid water of Recoletos Falls before the first leg of our ascent to Mt. Tres Marias is really a beneficial choice. We may didn’t get the chance to stay that long in the stunning innate beauty of Recoletos Falls, but we all have been satisfied with what it has to offer to all of us. I will certainly be going back soon if I get the chance. Ride a motorcycle (habal-habal), or bring your own vehicle to take you to Barangay Sampao. Travel time is about 20-30 minutes going to the drop off area. At the drop off area, you’ll be finding out a signage leading to the waterfalls. You can trek all by yourself if you’re traveling alone going to the waterfalls or you can hire a local guide just near the drop off area. Motorcycle from Naval going to the Jump off area of Recoletos Falls and Ulan-Ulan Falls in Sampao is Php 80 to Php 100. Mostly, when you get back to the jump off area after exploring Recoletos Falls and Ulan-Ulan Falls, you probably be struggling to ride a motorcycle going back to Naval. I suggest that you better hire the motorcycle driver for your entire time of visiting Recoletos Falls and Ulan-Ulan Falls since both are just close to each other. The price is around Php 300 or you can haggle the price. If you also decide to hire a local guide, Php 100 is I guess enough. There is no mobile signal in these places. Just make sure your phone or camera is fully charged for picture purposes. There are no cottages along the sides of the stream and it is not a place to stay for overnight. Don’t ever go River trekking alone. Wrong direction of your feet could lead to bruises or anything that would cause you regret. Hypothermia can be a real risk. If you’re the person who’s not used of staying long in a cold water for too long, then you better wear wet-suits and pay attention to your body’s response. Note: This is part of our Independence adventure that happened last June 9-12, 2017 from summit to sea. Trekking to Mt. Tres Marias and exploring Sambawan Island and Lake Danao. Note: All expenses are split up into a number of people who joined during the entire trip. We are around 12 excluding our 1 guide to Mt. Tres Marias during this trip. 08:20 AM – Depart for Tres Marias Drop off area. Wow! This is just gorgeous!!! I love the pics of waterfalls that you take! The misty, foggy white beauties in the turquoise blue or emerald green background is just breathtaking! Its awesome that its not a difficult trek to reach this beautiful place. 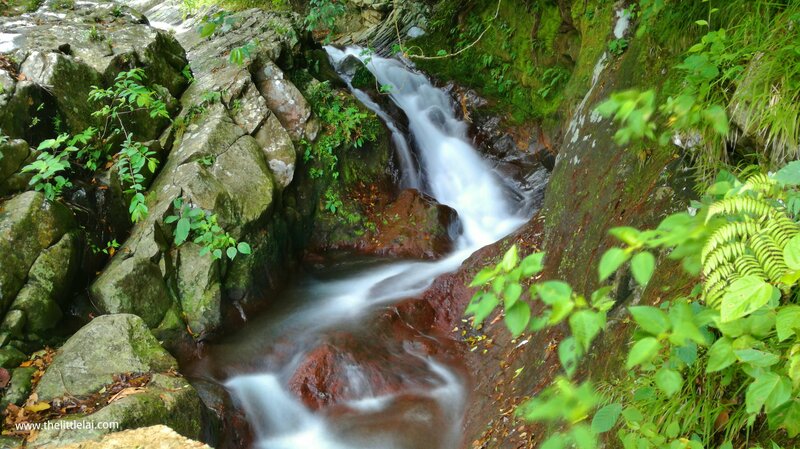 It`s such a wonderful feeling to know that there are still many falls and streams that are untouched. Many beautiful beaches are so commercialized nowadays. Your photos are really alluring. Nature really offers the best places. What an amazing place to cool off in the summer heat. The waterfalls look amazing. Wild swim are the best! I get you, I have no idea why I have a thing for waterfall either. You are very brave jumping in that cold water, but I guess you would regret it later if you didn’t take a swim in such an idylic location. Your images are stunning and I love the fact that you took the time to use a slow shutter speed option and really capture the essence of the place. Nice scenery. Beautiful location. what more can I say! Waterfall always amuses me. We can see how much you enjoyed your trip. 🙂 Informative post and nice photos. Thanks for sharing. I always find beautiful and natural places through your blog posts.This seems like another heaven on earth.The photos are really beautiful.I’d love to visit such places! Whoa! How do you find out such gorgeous falls! The place seems so untouched by touristy stuffs. This must be the fav holiday place of locals. Thanks for the elaborate break up of cost and time. Cold like a thousand ice cubes! I do not think I can withstand such cold water. I will have to stay on the sidelines only if I go there. The entrance fee is so cheap for something so beautiful! It amazes me that there are so many waterfalls in the Philippines that I haven’t been to yet. Funny that you mentioned that the water is cold, lately I visited some waterfalls and I noticed that their waters were not as cold compared to those that I visited in the past. How do you make that blurry effect on the water by the way? I love the way you have given the detailed breakup including the timings. I prefer this kind of information. Coming to the pool, it is not just natural, but naturally so beautiful. And so are it’s surroundings. This looks like an amazing experience I love waterfalls and would like to cool off in the water there. I like how you have shared the travel expenses this is really useful when I am planning my trips. A waterfall as a reward after a good trek sounds brilliant. I think you planned it well–a trek should have a goal, not just a journey, and a beautiful and refreshing endpoint makes it better. The basin of water by the falls looks like a really excellent place to swim. The falls is really scenic and can really be a great place to cool down. The landscape around the waterfall is so beautiful. I love the softness of the water, the greenery and blue tints all around. You have prepared such a nice, detailed itinerary. I would love to trek to Tres Marias Summit some day. Cheers!! Wow so peaceful. Are there a lot of tourist visiting the falls? Looks refreshing. That is a really great spot. I dig waterfalls as well. Such a beautiful natural creation. This is such a beautiful place, the crystal clear waters, and its color is awe-inspiring. 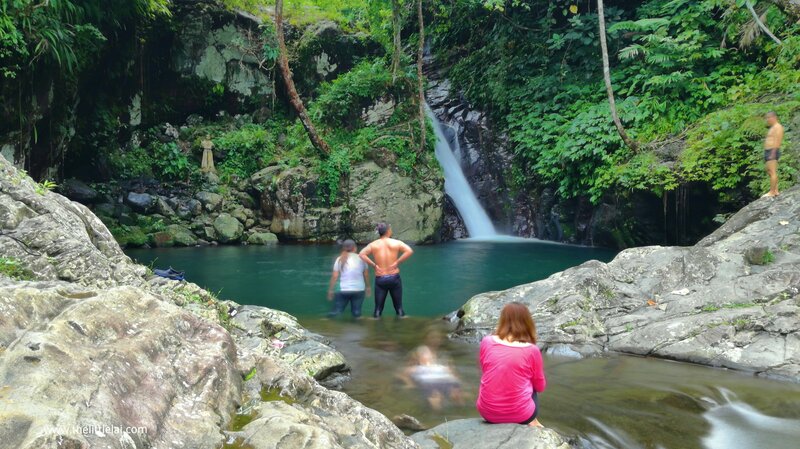 The secluded Recoletos falls and its pool nestled amidst the wonderful nature is a marvelous spot. We would love to explore this place when we visit the Philippines. Never would have thought of jumping into a cold pool. Hot springs, yes. Cold pools, no! But your experience has sure made us curious! Might just try it ourselves. wow, those views look so serene and beautiful. The water has such incredible color. And you captured the waterfall images really well. Must have been a wonderful trip. This looks super refreshing! And the colour of the water is beyond incredible. I did something similar in Cuba. Love it! I loved your pictures. The bluish green water with cliffs, greenery all around is making this place so serene.I too would love to swim in this natural pool but jumping from a cliff scares me out. I am in love with the Philippines, so many hidden gems. Wow!! The falls look beautiful. like straight out of a painting! 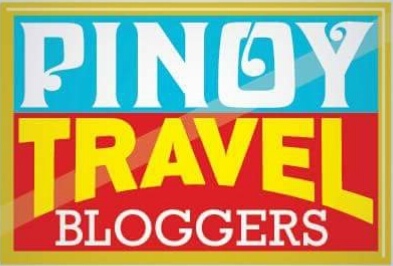 Love that you included an itinerary opf what to do aside from visiting the falls. i found something new again on your blog Lai! list keeps on growing and growing here lol Anyway, did you spent almost 3000 pesos for this trip alone? I know you said there’s some split bill but if on yourself alone, would it cost the same? Yes, 3,000 pesos for the whole trip, which include the fare from Cebu, climb to Mt. Tres Marias, Recoletos Falls, Ulan-Ulan Falls, Sambawan Island, Ormoc City and Lake Danao, also our food and everything. 3 days and 2 nights of adventure. You never fail to bring out another dazzling gem whenever you dive into the treasure chest that is the Philippines. The Recoletos Falls is another sheer ethereal falls. The clear blue waters and the pristine surroundings make the place look like paradise. Having virtually traveled with you across the beautiful islands, beaches and waterfalls of the Philippines, I seem to have had a ringside view of the beautiful country. I am happy that the local authorities charge entrance fees for this place else it would be spoiled by human activity. The blue colour of the water holds hope that Philippines would remain an environmentally- conscious place for travellers. Keep writing about these amazing places, my friend, you are unlocking a lot of gems of your country to the outside world. The water is so calming and rejuvenating. Looking at your photos and reading your post seems that it’s a magnificent place to visit. You are so lucky to still travel even if there are other things that need your attention. I guess it’s all up to time management. Right? I’m a sucker for a great waterfall, and this one is stunning. The frigid water would definitely give me pause too though. I’m glad you persevered however, it made for an enchanting tale.